If anyone thought a burger van couldn’t become a gourmet sensation, The Meat Wagon proved them wrong. The Peckham based mobile catering unit spent 2010 travelling London bringing their burgers (which many will tell you are the best they’ve ever had) to pubs, parks and festivals. The length of time people will repeatedly queue in the cold and wet is evidence enough of what fine burgers they are. On 6th December disaster struck when the famous wagon was stolen from its SE15 residence. Whilst a reward of free burgers for life for anyone who can help track down the lost vehicle has been offered, owner Yianni is keeping the burger’s coming with the opening of his new burger pop-up, #MEATEASY. Spelt with a hash tag in honour of their Twitter fan base, the temporary restaurant will occupy the upstairs of The Goldsmiths Tavern in New Cross. The pub, which is owned by the Capital Pub Company, will run as normal downstairs opening until 2am on Thursdays and Fridays and 5am on Saturdays. The #MEATEASY opens tonight and runs until 5th March, by which time it is hoped that the currently wagonless pioneers of the guerrilla burger (Not to be confused with the gorilla burger. Sorry.) will have raised enough money to buy a new van. A host of special events and parties are planned during the run, but currently unconfirmed. 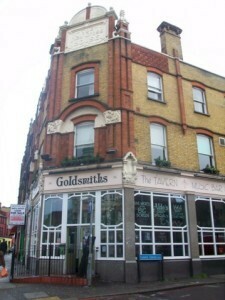 The Goldsmiths Tavern is at 316 New Cross Road, SE14 6AF. Follow @TheMeatWagonUK to be kept in the loop.